And Why You Should Care That I Do! I began showing dogs in 1969. At that time, the only legitimate places one could register a dog in the US was with the American Kennel Club and the Untied Kennel Club. AKC was founded September 17, 1884 and the UKC in 1898. To me, the most significant difference between the two is that from its inception, the AKC was a club of clubs (a delegate from each club was sent to form a registry for dogs) and was a non-profit organization. The UKC was a sole proprietorship, formed by Chauncey Z. Bennett and was formed to register hunting dogs and pit bulls. In 2009, the top five breeds registered with UKC were 1. Treeing Walker Coonhound (Scenthound Group), 2. American Pit Bull Terrier (Terrier Group), 3. Bluetick Coonhound (Scenthound Group), 4. English Coonhound (Scenthound Group) and 5. American Black & Tan Coonhound (Scenthound Group). In 2010, the AKC's top five were the 1. Labrador Retriever (Sporting Group), 2. German Shepherd Dog (Herding Group), 3. Golden Retriever (Sporting Group), 4.Yorkshire Terrier (Toy Group) and 5. Beagle (Hound Group). Today, there are over 30 groups in the US where one can register a dog! To me, this is almost unbelievable, but it is the truth. Why? It seems to me the only reason can be to put a tidy sum of money into the pockets of those who formed them. Several of them have slick websites that sound oh, so legitimate, but the bottom line is, "Do you have your money?" and "Do you have it with you?" is a not-for profit organization. is the largest purbred dog registry in the world. sponsors 21,000 dog events per year including conformation, agility, obedience, rally, tracking, lure coursing, earthdog, herding, field trial, hunt test and coonhound events. supports thousands of volunteers (I am proud to say that I am an AKC Canine Ambassador and put on programs in the local schools and library!) and teachers across the country who teach responsible dog ownership and saftey around dogs; features an education booth that visits more than 40 events a year. created and supports the AKC Canine Health Foundation (CHF), which funds researh projects focusing on the genetics of disease, the canine genome map, and clinical studies. 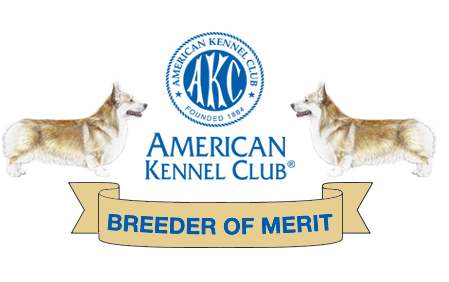 (While I sat on the Board of Directors of the Pembroke Welsh Corgi Club of America, Inc - an AKC member club since 1936, we approved the funding of research in partnership with the AKC CHF to find if the Pembroke was affected by degenerative myelopathy. The resulting research isolated the DNA marker for the disease in the Corgi and the information crossed over into the study of ALS (Lou Gerhig's Disease) in humans and helped further the research in humans, as well as dogs!) AKC has donated over $17 million to the CHF since 1995.
is the only registry that incorporates health screening results into its permanent dog records. Dogs certified to be free of hip or elbow dysplasia through the Orthopedic Foundation for Animals (OFA) and dogs certified to be free of eye disease through the Canine Eye Registry Foundation (CERF) have their clearance numbers printed on AKC-certified pedigrees and registration documents. began AKC Companion Animal Recovery (CAR), which has reunited more than 340,000 lost pets with their owners. created and operates DOGNY - America's Tribute to Search and Rescue Dogs which supports Canine Search and Rescue (SAR) organizations throughout the United States. conducts approximately 5,600 kennel inspections annually to ensure the integrity of the AKC registry and monitor care and conditions at kennels across the country. operates a Government Relations department that provides input for federal, state, and local legislation governing responsible dog ownership. offers the largest, most comprehensive set of DNA programs for the purposes of parentage verification and genetic identity to ensure reliabel registration records. maintains one of the world's largest collections of dog-related fine art and artifacts at the AKC Museum of the Dog, which is open to the public. houses the world's largest dog library, which is open to the public. manages a Registered Handler's Program that sets criteria and standards for responsible, knowledgeable, professional handlers. These are some of the main reasons why I will always register my dogs with the AKC. For an organization that started in 1884 which is the organization that processes the records for the second longest running sports event in the US, the esteemed Westminster Kennel Club (behind the Kentucky Derby by only one year!) and which organizes and runs the AKC/Eukanuba National Championship show, the AKC has certainly 'kept up with the times' and is firmly planted in the 21st century. They are certainly the champion of the breeder of the 21st century and even more important than that, they are the "dog's champion"! Make sure your next dog is an AKC registered dog. Make sure you get the BEST! Jimanie, established 1968, devoted to the Welsh Corgi and the Pembroke Welsh Corgi in particular. I am a member of the Pembroke Welsh Corgi Club of America, Inc. and have served as a Board Member, Vice President and as Webmaster,, a member of the Welsh Corgi League (UK) , the founder of and past president, vice president, treasurer and actively serving as Webmaster of the Palmetto Pembroke Welsh Corgi Club, Inc., a member of the Columbia Kennel Club, Inc., lifetime member of the Greater Columbia Obedience Club, Inc. and a member of the American Dog Show Judges Association, Senior Conformation Judges Association and the Dog Judges Association of America. All text and artwork ©1997 - present S.S. Hedgepath, All Rights Reserved. Buttons and artwork on this page are original artwork and are not to be used without written permission of the author. Permission to reprint or electronically reproduce any document or graphic in whole or in part for any reason is expressly prohibited, unless prior written consent is obtained from the respective copyright holder(s). Pegasus Web Productions and its affiliates are not legally liable for the information content of this system nor for the use of it.